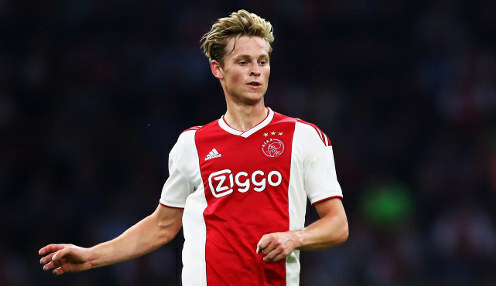 Ajax head coach Erik Ten Hag believes that midfield starlet Frenkie de Jong will have his pick of the elite clubs of Europe if he decides to move on next summer. De Jong has become one of the hottest properties in European football over the last 18 months and has been linked with interest from the likes of PSG, Bayern Munich, Manchester City and Barcelona. Everybody knows that Europe's five or six best clubs are watching Frenkie. However, Ten Hag is confident that the 21-year-old Netherlands international will remain in Amsterdam for the rest of the season, before weighing up his next move. Ten Hag told reporters: "There are many beautiful clubs and everybody knows that Europe's five or six best clubs are watching Frenkie. "Each player must make his own personal choice - the football that suits them best and that sort of thing. The Premier League is tough, but Ligue 1 is too - especially in a physical sense. "There are only big clubs interested in Frenkie and each has its advantages and disadvantages. A player has to think about that with their agent, however, this is not the time to talk about it." Ajax are currently in second place behind PSV Eindhoven in the Eredivisie, having dropped just five points from their 15 games played. They have also ensured progress to the knockout stages of the Champions league and can top Group E if they defeat Bayern Munich in the Johan Cruyff Arena on Wednesday evening. The Amsterdammers are 11/4 to defeat Bayern and are 12/1 to claim a 2-1 victory, with Ajax 5/1 to keep a clean sheet against the German giants.